I can never have too many primroses and no matter what is in the garden, when spring is in the air I must have more, and preferably the unusually coloured and quieter varieties of our wild primrose Primula vulgaris (also called acaulis - meaning stemless). The name itself has been said to derive from the Italian prima verola – the first flower of spring. Yellow always seems to conjure up images of spring, although interestingly the ‘red’ form of our yellow native primrose is found more usually in warmer Greece and Turkey and is known as Primula vulgaris var. sibthorpii. 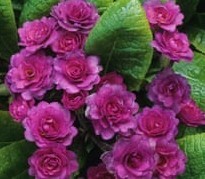 The very hardy ‘red’ Primula juliae was also rediscovered in 1900 in that same area (although back in the early seventeenth century a ‘turkie-purple primrose’ was reputedly in the garden of John Tradescant) and is a parent to the very popular old variety Primula Wanda, and many other beauties such as Lady Greer and Tawny Port. Primroses like a fairly heavy and rich, well-dug soil on the shady side and they do not like to dry out in the summer. They do better in the ground than in pots (as I have found out to my cost, probably because I’m pretty lazy at home in watering them) and dividing every few years will rejuvenate them. They are generally evergreen - although singles with a strong juliae parentage may overwinter just as buds and the odd flower will pop up throughout the winter before the main flush of leaves or flowers. Primula ‘Marie Crousse’ is also known as the parent of the famous Barnhaven double primroses after Florence Bellis discovered some rare pollen on one in the 1950s and began a breeding programme that is thankfully continuing to this day so that we can fill our gardens with lovely primroses.